Home » » Small scale fishermen condemn in arresting fisher leaders. Small scale fishermen condemn in arresting fisher leaders. 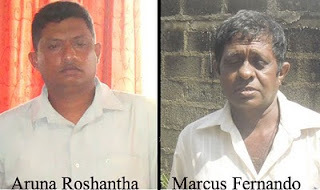 Two leaders of Alliance for Protection of Negombo Lagoon distributing a leaflet on Negombo Sea Plane issue were arrested by Negombo Police yesterday accusing that they were Provoking people on false fact as well as launching anti government activities. Arrested two leaders had been distributing a leaflet for educating general public on current sea plane project which is to be established on Negombo Lagoon. Arrested Marcus Fernando is a fishermen who leads the “ Negombo Lagoon Fisher People’s Organization works as a partner organization of NAFSO. Aruna Roshantha is the Chair person of “ All Ceylon Fisher Folk Trade Union”. Both they were playing vital roles against current sea plane issue as it does n’t help neither lagoon fishermen nor their lives. So, the police wanted to put them in jail with those charges. But, the lawyer who appeared at the police argued and later police HQI agreed to remove the charge under article 113, and produced the additional magistrate at Negombo and gave them the Police Bail. The court case will be on 14th December. Fisher people say that, this act as an oppressive mechanism of the government and strongly condemn them. With all these incidents, people will get more organized and united to go forward to fight against the Seaplane project at Negombo lagoon.